=Dev, Story= The Terrible Twelve! All Forums >> [Artix Entertainment Games] >> [AdventureQuest] >> AdventureQuest General Discussion >> AQ Design Notes >> =Dev, Story= The Terrible Twelve! That's right! It's time for the Terrible Twelve! The SeekRat has gathered 11 villains....er, maybe more like 10 and a half?....and raised their forces together to create one of the most massive armies we've faced in some time! Of course, they aren't exactly the best known villains out there....hm, should we really worry? Ah ah ah. They might not be the best of the best, but they're known villains from across the world of Lore and across the many years of AQ's history, and they all have a bone to pick with you! You've undoubtedly seen the preview by now, so you know that Stragath, Doc Sawbones, and Metalface are part of this team. But there are still a number of people unknown yet. And who is that strange man in black armor....why does he seem so familiar? What could his goal be? NEVER underestimate the lengths the SeekRat will go to, or his dangerous mind. And come to think of it, he looks different than he did before, doesn't he? What could be happening here? Be on guard, players, because the SeekRat has a master plan in mind here, and it may be further in reach than we can yet imagine! For part 1 of what might be the biggest event all year, you must defend Battleon against the villain's armies in a massive lose-able war! If you give them enough time to organize their armies and combine their forces, no amount of manpower will be able to overcome them! This timed war has multiple waves and multiple rewards at the end, but it's an all-or-nothing fight....if you should lose, there will be no praises sung in the streets, and certainly no rewards! As a writer, I've told you that my goal is to have you help me build this story. As such, this event is such a big deal because the result of this war will determine next week's release. That's right....if you lose, the release next week will be a different release than if you win! There is some overlap between the two, of course, but your victory or defeat will determine which release rolls next week. So now more than ever, you have a chance to change the storyline! This is something we've never tried before, and we may never be able to do again, so don't miss out on your chance to contribute to AQ history! Welcome to wave 2 of the war! Enjoy the cutscene you've unlocked, which reveals a little about what's going on in the background while we're fighting at the front lines! You may have noticed that you can now face three bosses. These are "challenge fights" against Champion Boss versions of each of the Terrible Twelve (except Twig), and they scale in units of 15. This means the first three bosses are at Lvls 15, 30, and 45. This pattern of increasing by 15 levels will continue as you beat new waves of the war, meaning that the last few bosses are perfect for the high-levels out there! But you've got to EARN those fights first! 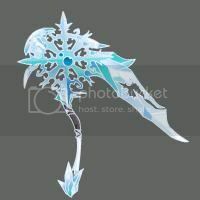 In honor of your speed through wave 3, here is your preview....a shiny scythe! Welcome to wave 4. This'll be my last DN post for this week. By now you've noticed the new monsters that the SeekRat has at his disposal. He has developed superior monocle technology that grants the wearer great intelligence and magical prowess! Side effects may include a dash of British-ness. Please consult with your doctor before using monocles.